I was not planning on stopping at the Street Meet food truck. That was before I spotted their hood ornament, which caused me to think of my pug. When it comes to food, all animals can “fly” when it comes to getting good grub. The speed at which my normally slug like dog can move when someone drops food on the ground is amazing. It’s a light meal that usually uses local area ingredients found near Nice, which is a Mediterranean port city. Nice’s climate is about the same as Vancouver. It is drier (which city isn’t in comparison to Vancouver) is only 5 degrees warmer in the winter and has the same temperatures in the summer according to Wikipedia. This could partially explains why I feel Nicoise Salad, when done well, is a perfect thing to have when it’s sunny & warm in Vancouver. The Street Meet version omits the anchovies and on my first visit they ran out of potatoes. It didn’t matter, the salad looked appetizing and its components were well made and complimented each other. The seared tuna was great. What made the tuna stand out was it was encrusted with a tarragon mixture that gave it more flavour. 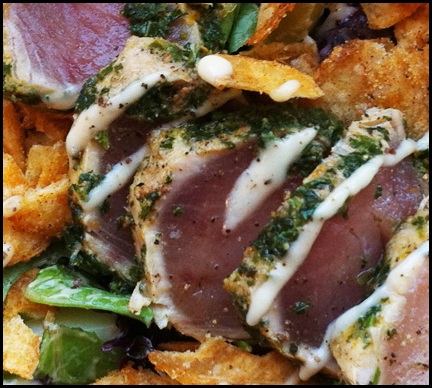 The herb coating made the tuna less boring and provided a more complex taste. The rest of the salad consisted of medium boiled eggs (so much better than hard boil), pickled green beans, Kalamata olives, honey Dijon vinaigrette, cherry tomatoes, salad greens and bits of Street Meet’s homemade kettle chips. Each of the elements of the salad provided a distinct and strong taste to the salad: the beans were tart, the olives were salty, the vinaigrette and tomatoes were sweet, the egg was creamy and the salad greens were neutral. I thought the inclusion of the kettle chips seemed odd, but it worked. 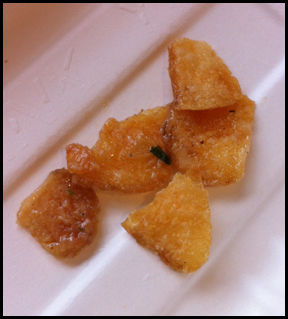 It provided a crunchy texture and a subtle earthiness to the salad. I liked them more than croutons. 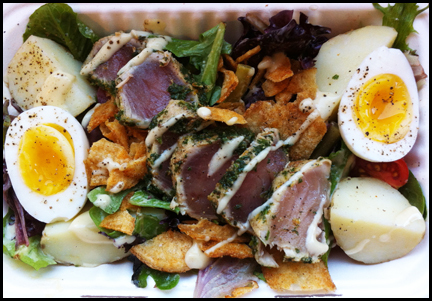 I enjoyed the Nicoise salad but couldn’t help but wonder what it would taste like with potatoes. So a second visit I went. With the inclusion of the potatoes, the salad was more harmonized and filling. I found the spuds toned down the other elements. You could still taste all the ingredients but one didn’t overwhelm another as much, especially the salty olives. From years of making mashed potatoes, it made sense to me as potatoes have an uncanny ability to absorb a healthy dose of seasoning, like salt, but still taste bland. 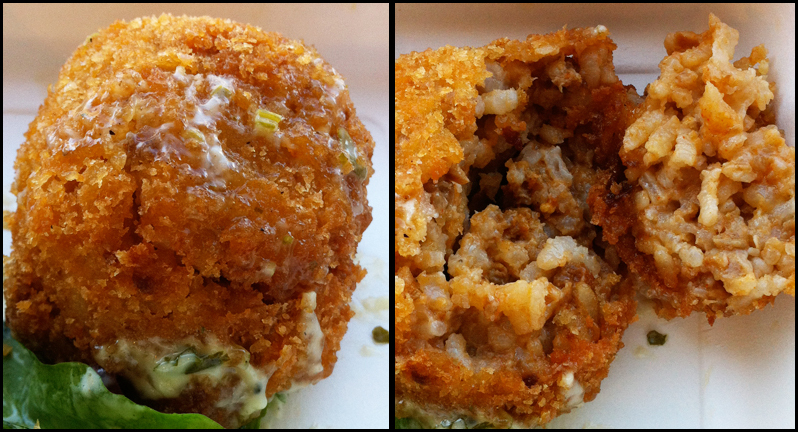 In addition to the salad, I also picked up deep fried risotto balls. I was surprised how large they were. They were the size of a large lime. I was worried they would be greasy but were not. The risotto balls were perfectly crispy on the outside and mushy on the inside. The chorizo sausage had a spicy kick and its flavour was present in each bite. If they made these things smaller, like popcorn size, I would probably eat a whole bucket of them. Overall I enjoyed the items I got from Street Meet. 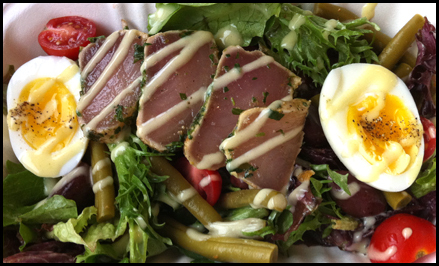 The Nicoise salad was composed of quality ingredients. Both it and the risotto balls were prepared well. I look forward to flying down to this food truck and trying out their other offerings on their menu.